The mask rehydrates, brightens, and lightens dark spots. It is perfect for dark spots and dull skin. I got Garnier's Super-Hydrating Brightening Tissue Mask, it's good though I didn't liked the smell a lot and the mask is too big for my face. But I loved the fact na hindi tinipid yung serum sa mask. I even applied the excess serum on my neck and arms. And super loved the glow on my face in the morning! I can't say that it's effective because I have only used it once. Will I buy? No. There are other masks that are cheaper and can deliver results same as this mask. Thank you Try and Review! This mask really is refreshing -- as if it came from the fridge. I felt a light twinge but hardly noticeable. Fit of mask is a bit awkward though. The eye holes kept poking my undereye. The afterglow of the mask can be seen because it definitely made my skin brighter. Will definitely use this again and try other variants as well. 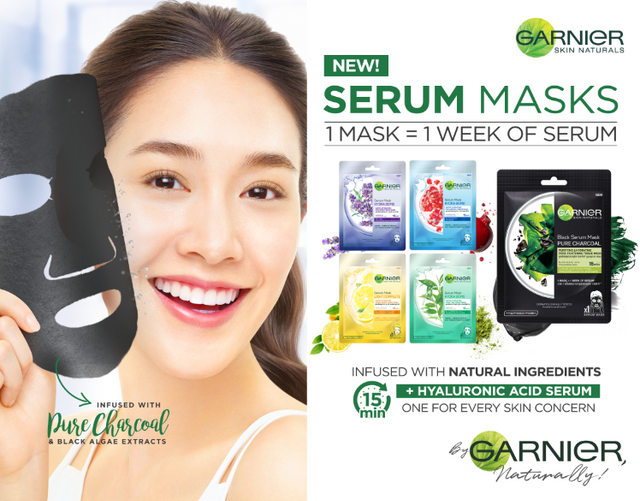 This serum says it is equal to a one week of serum, and for those who are not really into a daily basis of skin care routine, this will suit you. Like any other facial mask this is easy to use, and it has this removable film for easier fitting on the face, (but that is an additional waste so for me, this can do without the film). The serum has a cooling effect on the face and does not feel sticky after usage. But having an oily skin, I think I will have to use other variants that will suit my type of skin, but I will definitely recommend this to others who have normal type and wants to have less dull skin.